The stupa is probably the most revered symbol in Buddhism. Its shape is based on the memorial mound raised over the mortal remains of the Buddha Shakyamuni. For the early Buddhists, the stupa was a symbol both of the Buddha's Parinirvana (extinction) and of the faith itself. Images of the stupa abound in Buddhist art, in media as diverse as stone, bronze, crystal and gold. 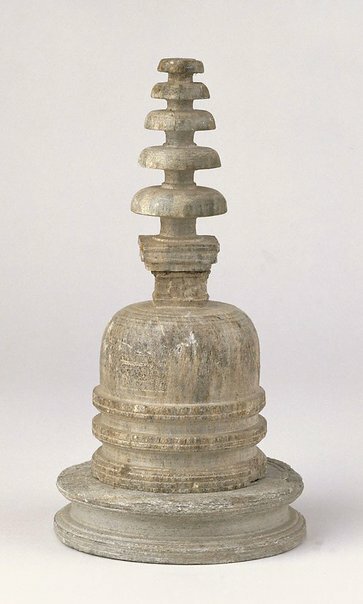 This formally proportioned stupa is typical in construction: a base, a hemispherical body surmounted by a 'harmika' (a square structure derived from the fenced enclosures of early shrines), and crowned by a multi-tiered umbrella. The Asian Collections, AGNSW, 2003, pg.26. The Asian Collections Art Gallery of New South Wales , 'Buddhist Art', Sydney, 2003, 26 (colour illus. ).